What happens when your childhood hero is no more? The person who inspired you to become someone who can question the ways to find answers or new ways. Today ! Is the day. 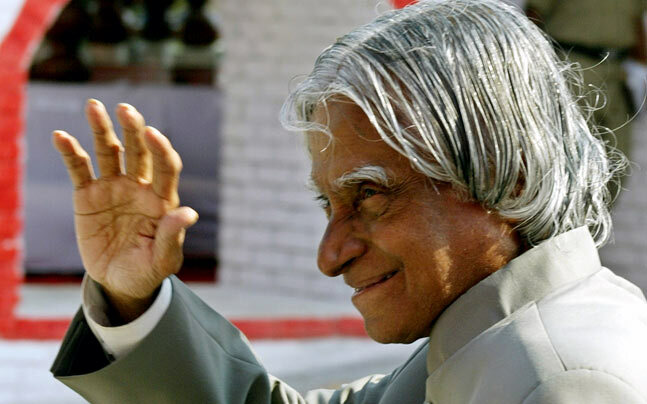 The day that brings catastrophic damage to heart of young scientists and believers of Kalam Sir. He is no more there and was giving a lecture at IIM Shillong. This deep feeling of grief ! He leaves behind something that may be undermined if called a void. The man who made India capable of launching missiles that no one could imagine.A national hero! His books on angelic ways of thinking about science and development of our nation are the light we all must follow. His humble beginnings to charismatic term as the president are inspiration to all. He probably is the most respected President the country ever had. He glorified the meaning of the word science and scientist and the change they could bring to the society. In his books particularly the Wings of Fire and Ignited Minds his plans, vision and stories for a better India and the India he wishes to have will all be with us till that vision is achieved. As children we grew up reading his stories in our textbooks and looked upon him as an inspiration. Science was particularly interesting and It became more interesting as we read about his journey in the epic “Wings Of Fire” in which he describes how India kick-started its missile programme using indigenous tools and techniques when the world’s greatest powers offered little support. His ideas ignited the spark many of us as a child to pursue science for its perennial joy of fun, discovery and amazement. For it is a fundamental key to a better future/nation/planet.Science and Technology can change everything! He was in fact the very first few of “Make-In-India” men! I still remember that anecdote about Beryllium Diaphragms. In 1975, ISRO needed Beryllium Diaphragms for a new device. Today, you can see this Diaphragm in high quality audio speakers. But, four decades back, a few nations had the ability to make them. Hence, we approached a US based company which agreed and the paperwork was readied. Just when we were about to complete the transaction, the US Government had blocked the sale as this material was being used in their strategic missiles.Denied of a critical product, we started learning more about it. The US diaphragms, were made from Beryllium rods produced in Japan. We further discovered something startling. Beryllium is a rare element, and only a few countries possess it. India was among top-4 producers of raw Beryllium. The Japanese company which produced the rod, imported Beryllium from us. We were dismayed to know that a product whose raw material we possessed, almost exclusively, was being denied to us. Then a committee of top research laboratories was constituted and given the challenge to make a Beryllium Diaphragm of our own. In four months, we triumphed. But what’s important is his ways that he has entrusted upon us to carry his path to lead our country and the world to glorious heights. His outlook is what he has taught us. He rose beyond the menial engulfments of religion, politics and wealth to enamour us with his ideas. He dreamed of a self-reliant India for it brings self-respect. Self-reliance, respect, dignity, power! Power Respects Power and fear has no space. We don’t have a x,y or z? We will make it! The very attitude the present Indian needs. Today the dreamer has transcended sowing his seeds in our minds.